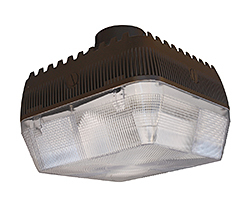 The GFP80, with a low profile and multiple mounting capabilities, provides options for parking garages and other low-mounting-height applications. Features 100-watt and 70-watt Icetron induction systems in ceiling, quick-mount, garage or pendant styles. The units have a 100,000-hour rated life with 80 CRI and operate in a range from -40 degrees C (-40 F) to 40 degrees C (104 F).